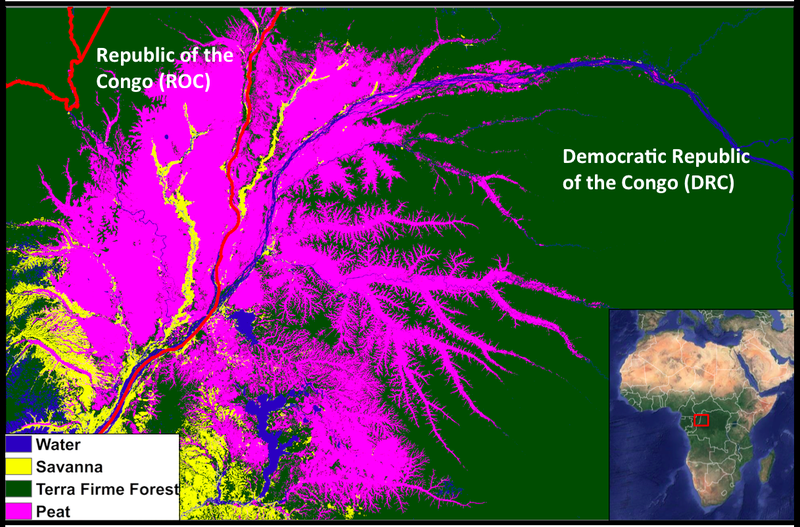 The presence of the world’s biggest tropical peatland was recently confirmed in Central Africa. It is the size of England and straddles the border between the Democratic Republic of the Congo (DRC) and the Republic of Congo (ROC). However, conservationists and scientists worry it may be at risk from logging and development. They caution its destruction could release “vast amounts” of carbon emissions. Others say the threats are overblown. Conservation leaders and representatives gathered this week at COP23 in Bonn, Germany, say protections could exist through REDD+ projects that could give local communities management rights and provide financial incentives for leaving the peat forest intact. BONN, Germany – A few weeks ago, international scientists, government officials and forest advocates visiting a remote community in the Democratic Republic of the Congo (DRC) confirmed the presence of one of the world’s largest and most important carbon sinks – a vast and deep peatland the size of England. Here at the 23rd United Nations Climate Summit, COP23, where European and African nations gave presentations over the past two weeks regarding the overlooked importance of peatlands for carbon sequestration, recent word of the huge finding on the border of DRC and the Republic of Congo made the rounds. That, of course, is the biggest concern now that this 155,000 square kilometers of peatland has been located in two poor African countries desperate for development. he recently discovered peatland is believed to be the largest tropical peatland in the world. Image courtesy of Dargie et al., 2017. Scientists are racing to learn more about the peatland as loggers move to fell and drain the forests above it to make way for roads and developments like palm oil plantations. Meanwhile, local communities are hoping for greater protection of the region as government officials try to drum up more support for conservation initiatives here at COP23. Floribert Botamba, a World Wildlife Fund project coordinator for REDD+ projects in DRC, said in an exclusive interview with Mongabay that he believed the enormous peatland in the province of Équateur qualifies for protection. However, he downplayed its threats. The risk, though, still exists. And while swampy areas may be costly to log, there is precedent for peatland development in other places such as Indonesia where massive draining of peat swamps for plantations led to the country’s 2015 haze crisis. The devastating months-long event is blamed for the deaths of as many as 100,000 people and released 15 to 20 million tons of carbon per day – exceeding the average daily emissions of the entire U.S. economy. Peatlands can be converted for human use by digging drainage canals. Photo taken in Indonesia. Once drained and dry, peat is highly combustible. 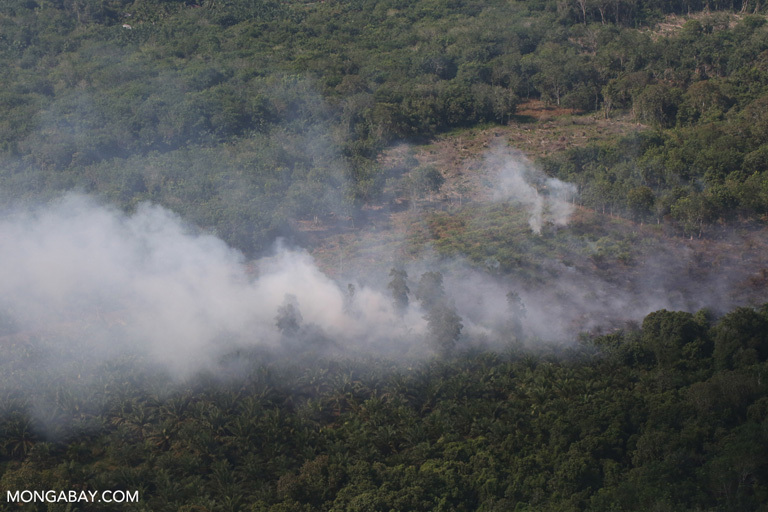 And once ignited, fires on peatlands can be difficult or impossible to control. Photo taken in Indonesia. With global carbon emissions set to hit an all-time high this year through energy generation, the transportation sector and deforestation, conservationists say clearing of the peatland could thwart efforts to reduce emissions and slow the rate of global warming. Griscom at The Nature Conservancy said often on lands filled with carbon and natural resources, the argument for protection loses out to job creation and company profits. Botamaba with WWF said there is a possible way to protect the peatlands in DRC while providing opportunities for the people who live around them. Given his expertise, Botamba said he believes the peatland could possibly qualify for REDD+ financial incentives. “In the REDD process, we have five principles in which to qualify for funds: climate, biodiversity, community rights, livelihood and finance. To do a REDD program, you have to make sure you include all five. “If you do community forest management, you improve the climate by holding carbon. You increase the biodiversity because most of the wren population in the country is in that area. If you are paying the community to take care of such an area without disturbing it, you are improving their livelihood. 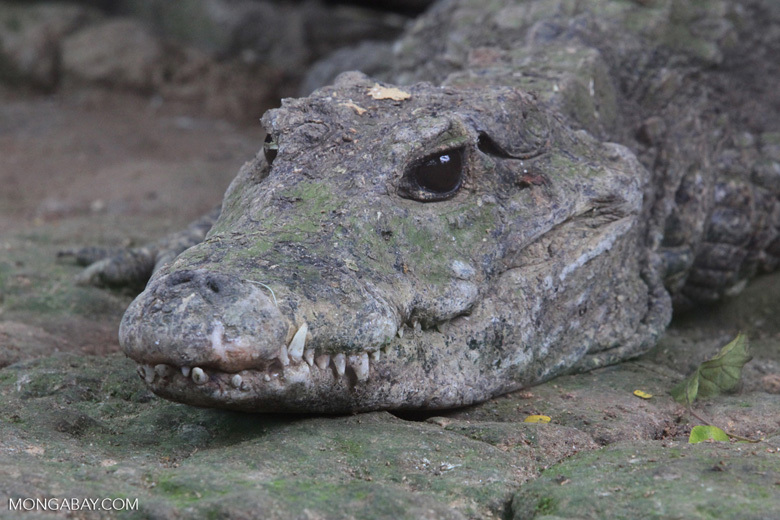 African dwarf crocodiles (Osteolaemus tetraspis) have a range that comprises the peatland, and are listed as Vulnerable by the IUCN. The big question, Botamba agreed, is money. 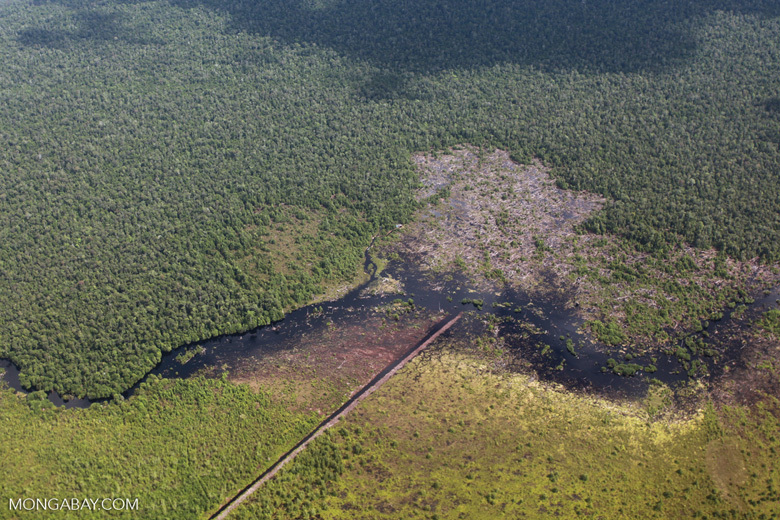 Will these peatlands actually qualify for REDD+ financial incentives, and if so, how much and when will it received? If it doesn’t qualify, will private donors step forward to help preserve this enormous carbon sink and keep the community or province from monetizing the land for logging or extraction? Daniel Blattner, a former logger turned environmental entrepreneur from the DRC, said he is eager to help identify the resources, like REDD+, to protect the newly identified peatlands.